The photo on the left shows both a 4 station turret tool post designed by GH Thomas and a rear parting off tool post for the Myford ML7. 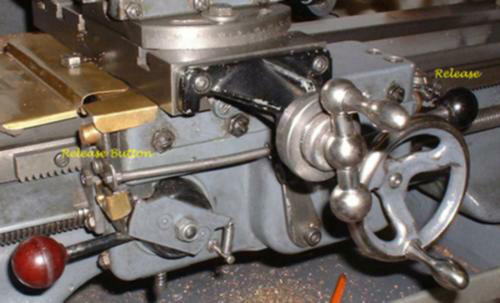 On the right is a rear tool post for the BH600G based on a design originally for Hardinge lathes. All tool posts must be robust and well seated to the top or compound slide as rigidity is key to success. I designed and made this attachment for the Myford ML7 lathe. 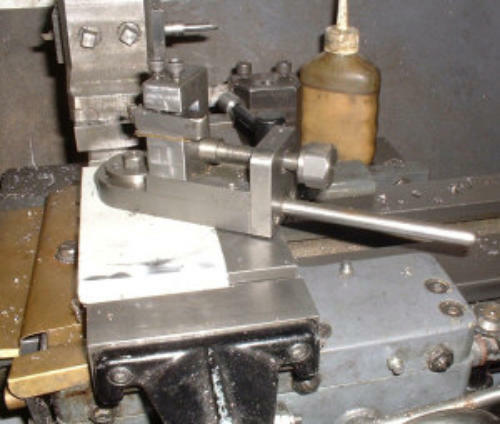 It enables loger tapers to be turned and more accurately. The taper angle is set based on a sine angle similar to commercial available Sine Bars. I designed this jig based on another design to fit the BH600G lathe. The major attribute with this design is the ability to ‘dial in’ accurately the required diameter. A simple tool but essential should long small diameters be required. 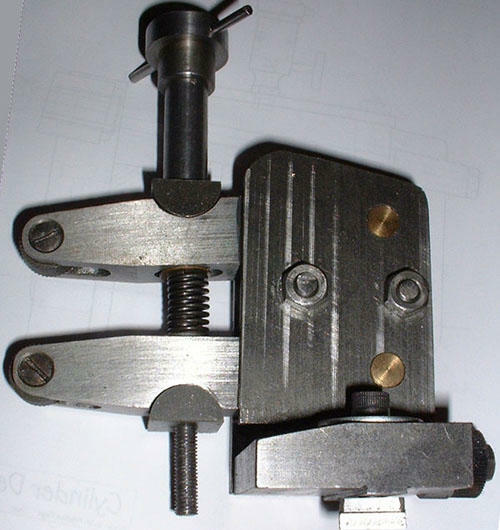 This jig was designed by GH Thomas for the Myford lathe and is a very clever design which enables the screw cutting tool to be retracted at the end of a forward cutting pass so that the tool can reverse and be clear of the thread. This tool is to my design to fit on the Myford. This is an essential accessory when it comes to cutting key- ways for gears or similar. The design allows for the large cutting forces to act without imposing wear on the Myford slide, thus the long operator lever! The Myford made clutch was another expensive accessory but it is very useful especially when needing to make repeated checks on the diameter of a work piece without having to repeat-ably turn off the motor. The clutch I made is an adaptation of that used by Myfords in their Tri-Lever speed selection device, it is however very basic yet fully functional. The success of this ‘clutch mechanism’ led me to make another for the BH600G lathe which has a belt drive and so easily incorporated. I designed this mechanism to enable the Myford ML7 lathe when screw cutting to release from the lead screw. Although manually operated in conjunction with the retractable screw cutting jig it makes cutting threads easy to do. I designed this jig to enable knurls to be cut without imposing any stress on the lathe spindle bearings. With the arrival of the BH600G lathe the jig was slightly modified for dual use!. 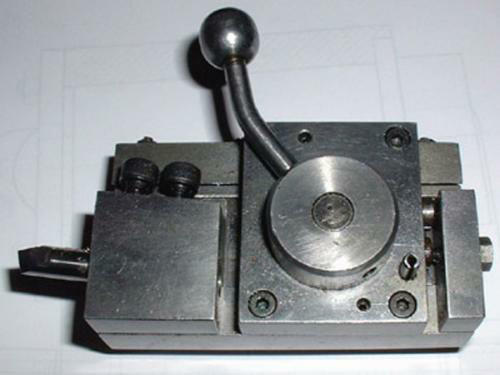 I designed this ball turning jig for the Myford lathe which was able to produce both balls and convex recesses. 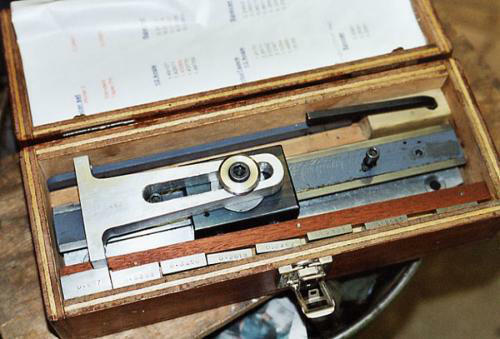 The latter was used to make a ball adjustable tool rest for the cutter grinder. The tool has been re-designed for the BH600G and this only provides for ball turning however it is easier to set up for use. This is a jig designed by me specifically to fit the Bh600G bed. It not only provides a stop to ensure consistency when machining lengths to the same dimension but also provides an LED which illuminates on contact. This feature is there to act as a visual stop but also as a safety feature. If work is being done close to the headstock then the stop is set to illuminate prior to any collision however should the operator miss the LED warning or go past then the stop will automatically shut down the motor. I designed this boring head for the milling machine. It allows auto surfacing and auto shut off triggered by stops. 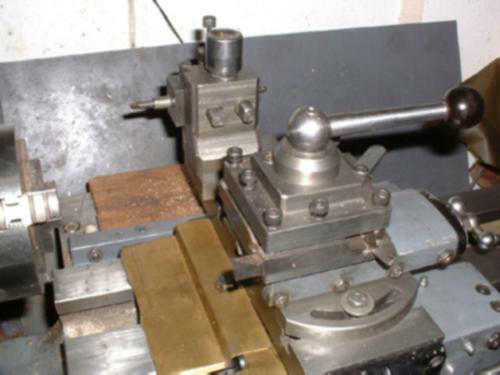 The jig facilitates very small settings to be made for boring precise diameters and is fitted with an R8 mounting stem though other stems can be also fitted for use say in the lathe. 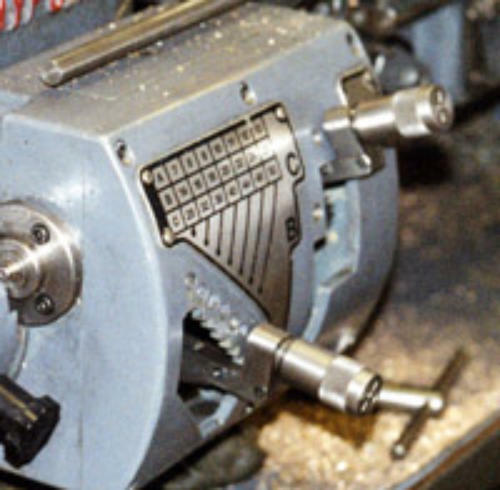 This jig works on either the Myford or BH600G lathe and I designed in the use of an LED setting gauge normally used to find centres of diameters on the milling machine. The jig is very easy to use and guarantees the tool cutter edge is exactly on centre height for the lathe. 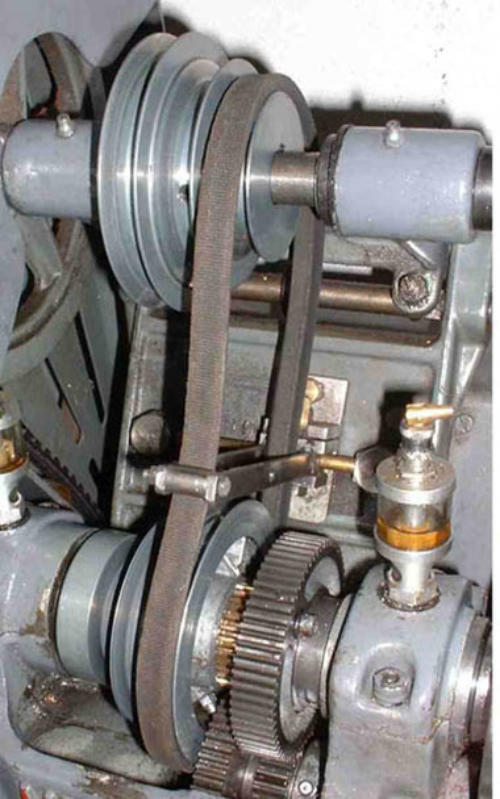 a project to refine a previously designed belt drive mechanism which provided power from the belt pulley connected to the gearbox input shaft. The new refined mechanism builds on the belt drive concept but now uses a small gear train to drive a gear fitted to the gearbox input shaft giving considerably better fine feeds than before and without any additional noise. These were made for the model project ‘Neptune’ and subsequently for the ‘Seal’ 15cc ic engine. pump remotely operated by foot control.